Mangalore, Sep 9. 2014: The elephant menace continues in Mandekolu. Villagers tried to chase the elephants, a herd of jumbos attacked the villagers. The elephants have damaged crops at Akkapady, Kalladka and Peraje. A herd of elephants have been camping in the region. 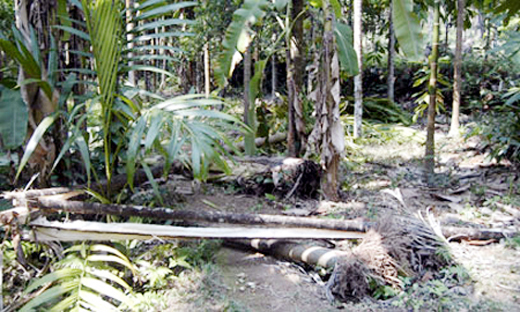 250 banana plants, 75 arecanut trees, five coconut trees, and irrigation pipes were damaged. The elephants have been damaging the fences built on the periphery of the forest. DC A B Ibrahim and other senior officials from forest department visited the spot on Sept 7. To a query on how the blood will be collected and preserved for implementing the project, Trust Working President Kadaba Dinesh Rai said that Trust will tie up with various organisations that conduct blood donation camps and collects blood. It has been planned to develop a blood bank with modern cold storage unit and blood testing lab, at an estimated cost of Rs 5.10 crore. The project is likely to be implemented from January 1. People who are interested to register as members can contact Namma Tulunad Trust President G VS Ullal at 9964669218 or Dinesh Rai at 9901833532.